I have two big passions in life: travelling and history. Since I've always been fascinated by the Moorish culture, last summer I went to Malaga, an amazing Spanish city located in the Andalusia region. This is the reason I wanted to see and write about the Moorish Monuments in Malaga. I searched on Skyscanner a cheap flight and then I started looking for a hotel in the centre of Malaga close to the sites I wanted to visit. Once settled these matters, I was happy like a child: in Andalusia you can find most of the monuments that the Moors left us. Maybe you don't know that, even if the word Moor is now used to refer to all Muslims, this word comes from the Latin “Mauri” which is the name for the Berber tribes living in Algeria and Morocco. In 711 the Islamic Moors crossed the Strait of Gibraltar and conquered most of the Iberian Peninsula, except for north-western area. They gave their territory the name Al-Andalus, which at its peak included most of modern Spain, Septimania and Portugal. The Moors ruled parts of Andalucia for 800 years and their influences can be found today in the Spanish culture, language and architecture. In addition, the Arabs transmitted their great knowledge to the locals and introduced in these territories a sophisticated irrigation system with a complex network of wells and channels which brought water into the very heart of buildings. 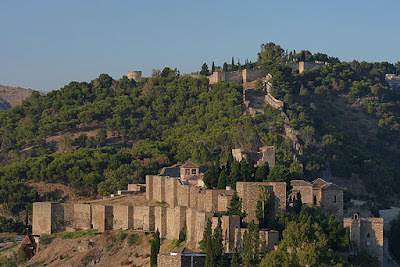 Among the surviving examples in Malaga I visited the Alcazaba and Gibralfaro in Malaga. 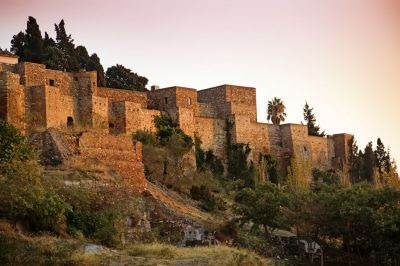 Built by the Hammudid dynasty in the 11th century, the Alcazaba is one of the best preserved palatial fortification in Spain. The word alcazaba comes from the Arabic al-qasbah, قصبة and means citadel. Next to the entrance of the Alcazaba you can find the remains of a 2nd century Roman amphitheatre. Part of the materials used for the amphitheatre were reused in constructing the Alcazaba. The main entrance to the Alcazaba is a gateway called "Puerta de la Boveda" (Vault Gate). The entrance gate doubles back on itself, in order to make progress difficult for attacking forces. The pathway goes through magnificent gardens with fountains and labyrinth passages: believe me, this place is magical! The inner citadel can only be accessed through the “Puerta de los Cuartos de Granada” (Gate of the Granada Quarters) which was constructed in order to defend the western part of the palace. Inside the second wall you can admire the Palace and other dwelling of the 11th, 13th and 14th centuries. 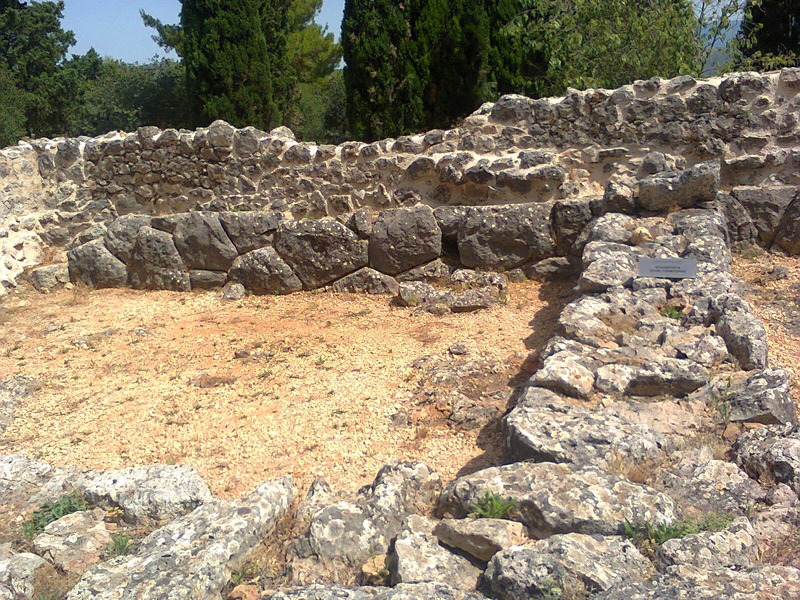 Here you can admire also an Archaeological Museum which hosts many Moorish and Phoenician finds. I also took the opportunity to visit the beautiful Castillo de Gibralfaro (Castle of Gibralfaro) whose construction dates back to the 10th century. There are 2 options for reaching this interesting site: by bus or on foot. I chose the second one: I took the scenic Paseo Don Juan de Temboury, to the south of the Alcazaba. 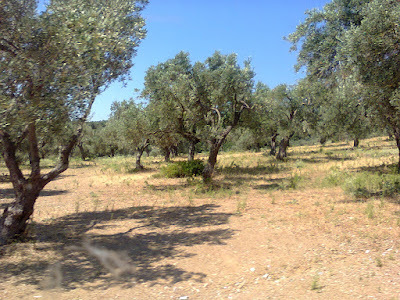 It was a long walk, that it might be difficult on a hot day but it surely worth it. Alternatively, you can take bus 35 from Avenida de Cervantes to reach the castle. The name Gibralfaro derives from the the Phoenician word gebel-faro that means "rock of the lighthouse". In fact, the Castle was built in 929AD on a former Phoenician lighthouse. Built by the Caliph of Cordoba Abd-al-Rahman III, the Sultan of Granada, Yusef I, who reigned between 1333 and 1354, enlarged the building adding the double wall down to Alcazaba. The fortress was used for military uses until 1925. Even if the Castle of Gibralfaro has deteriorated over the years, in this historic monument are still visible the walls, which have been restored so that you can walk round them. Located on a high hill, from this fortress you can enjoy a magnificent view of the sea and city of Malaga. Apart from the rampart, there's the Torre Blanca, a large tower and the airon Well carved out if the rock. The well is 40 metres deep. Near the entrance of the Castle is located the Centro de Interpretación de Gibralfaro, a military museum where you can see uniforms, arms and objects used in the past as well as some information about how the fortress was used over the years. It’s a little museum but very interesting, don’t miss it! P.S If you are interested in visiting these two masterpieces of Moorish art in Malaga, I recommend buying the joint ticket for both the Gibralfaro and Alcazaba to save money. 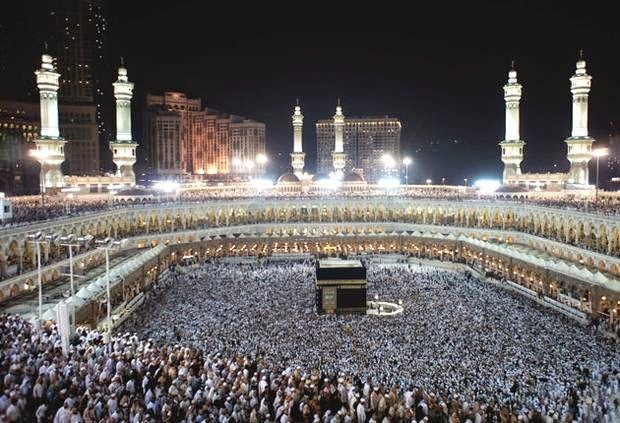 Read also a brief guide of Mecca, Saudi Arabia! I have just visited the island where the first flag of Greece was created. It is here where the true independence of Greece began in 1807 and wherefrom the revolution against the Turkish Empire spread over the country. This is Skiathos Island(see the map). 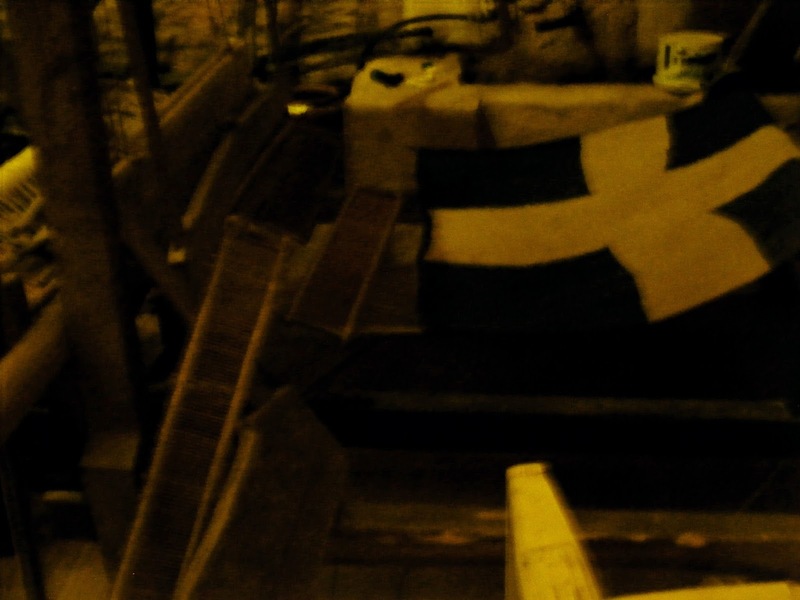 Three days after the referendum in Greece in 2015, we were ready to visit a place so full of history, tradition, revolt and freedom that only one who is ready to really understand Greece, would feel our anxiety. We have visited Greece almost every year since 2008. Skiathos, this beautiful island where Greece found its origin as an independent nation-state in the 19th century, was our first destination. We knew nothing about the flag and about the importance of the island. Now, we were waiting for a small bus to take us to Evanghelistria Monastery. 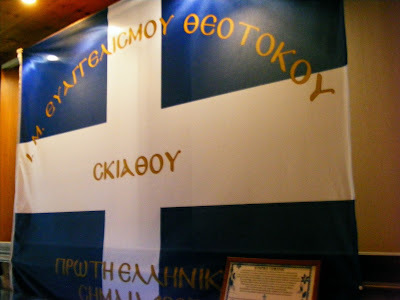 There, the monks created the first flag of Greece. There, the bells called for freedom and independence and the entire Greece knew the time had come and the battle was about to begin. We had to feel the area in order to understand the spirit of Greece independence and need for justice. And the highest peak in Skiathos Island, where Evanghelistria Monastery was founded in 1794, was the place. There was a 60 years old woman who wanted to join us on our visit to the monastery. She wanted to find the holly water spring. According to legend, that water cures. Only a few are interested in the history of the place. You walk alone on the independence of Greece like the country did 200 years ago. Anyway, the woman was told that there were snakes near the spring and that she was not allowed to go. 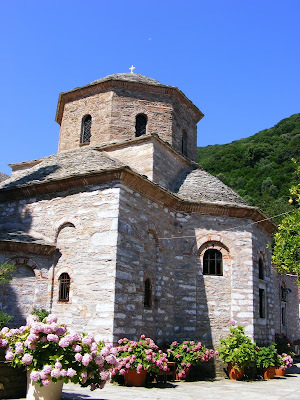 To get to Evanghelistria Monastery, one needs to take a small bus. 15 minutes. And then you understand. The monks and freedom fighters who swore on the Oath of Freedom here in 1807, could see the area, could see the sea and knew when to enemies were about to come. It is the highest peak of Skiathos Island. The independence of Greece began. Athens was conquered by the Ottoman Empire in 1452. The Islands were forced to surrender in the late 17th century. Yet, the Greeks have never accepted the Turks. The Islam was a primitive religion in their opinion although the Orthodoxism has been tolerated by sultans. We found here, at Evanghelistria Monastery, a different world. We felt like being in 1800 when a nation who had to fight against invaders, since Sparta decided to do so and Xerxes, the defeated Persian Emperor, started a different kind of battle: it was the battle for freedom this time but it was on its own land. Guns, a cross, a flag and walls. 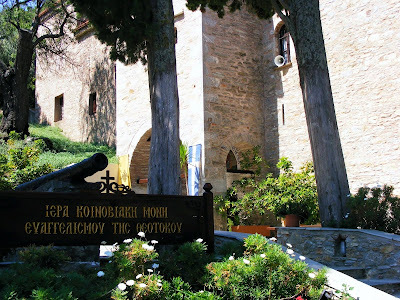 You can't bet the monks here at the place where the first flag of Greece was created, don't hide pistols, swords or knives somewhere in the neighborhood, ready to get them and start the fight again. Everything in the area is ready for war. A few monks live here. They answer your questions. They guide you even to the toillet, They gave the holy water our friend was looking for. They do not smile. A friendly and kind look is the only thing you'll get. The Kollyvades were monks who left Athos after a fight against the community of the Holy Mount and founded the New Orthodoxy in the middle of the 18th century. It was a movement worried about the spiritual renewal of the Greek people. Kollyvades comes from Kollyva which is boiled wheat, used during funeral services. They came to Skiathos Island. And in 1807 the bells called for freedom and independence. They also made the first flag of Greece, here at Evanghelistria in Skiathos. 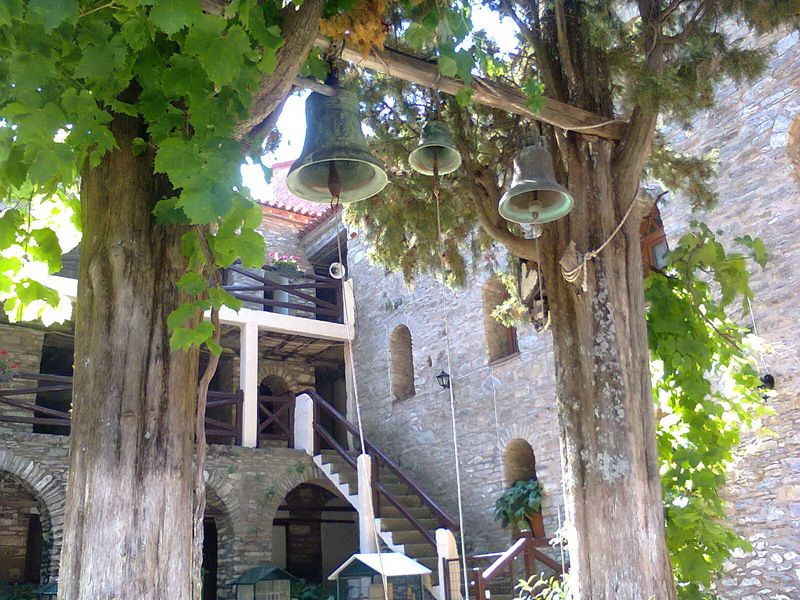 Here, at the Evanghelistria Monastery, you can see how the first flag of Greece was made. Some include the blue and white formations on the Achilles' shield, others believe they are only the colours of the sea, waves and sky. The first flag of Greece was wove and raised here. The loom can be seen in the Museum. You have the chance to walk alone and visit this museum. Only a few are interested in Greece independence. In 1807 the flag was ready and for the first time it was raised. The bells rang. The war began few years later and Greece found European allies and conquered its independence in 1832. In Skiathos Island, one the Aegean pearls, people have never forgotten that their home was 200 years ago the home of the revolution and part of the war for independence. Their flag is the witness. Thank you for reading our post and for sharing. You may find interesting The River Styx-the ancient Greek river of the dead. The history of Mecca is related to Muhammad, the last great prophet of humanity and the founder of Islam. Home of Kaaba, the sacred Black Stone sent from Heaven as Muslims believe, Mecca or Makkah is not quite a travel destination from the Europeans, Americans or let's say non-Muslims' point of view, for it is the heart of a religion many people do not really understand or accept, unfortunately. 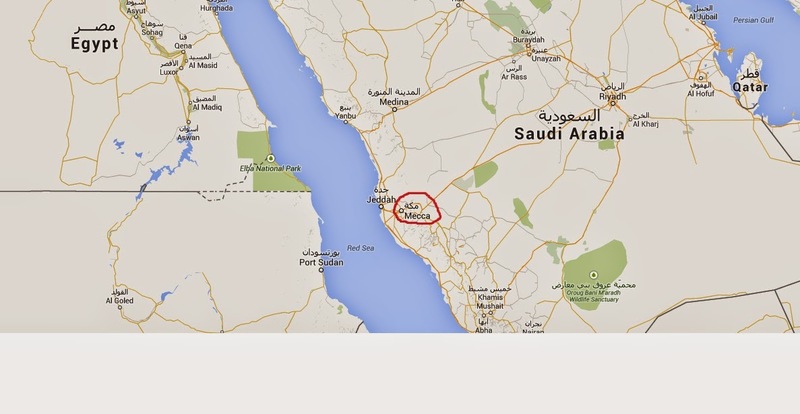 Capital of Makkah province in Saudi Arabia, it is located 70 km from Jeddah. Mecca is also Muhammad birth place and it is considered the holliest city of Islam, for here the Quran was first revelated to the prophet. In 567 A.D. Muhammad is born. Member of the privileged Quraysh tribe, at the age of 6 he lost his parents. His grandfather and an uncle took care of him and at the age of 25 we find him as employe of a rich 40 years old widow, Hadige. She was the one who encouraged him in his religious experiences. They had 7 children, 3 sons who died soon after their birth and 4 daughters. He met no other woman before Hadige's death but had 9 wives after. 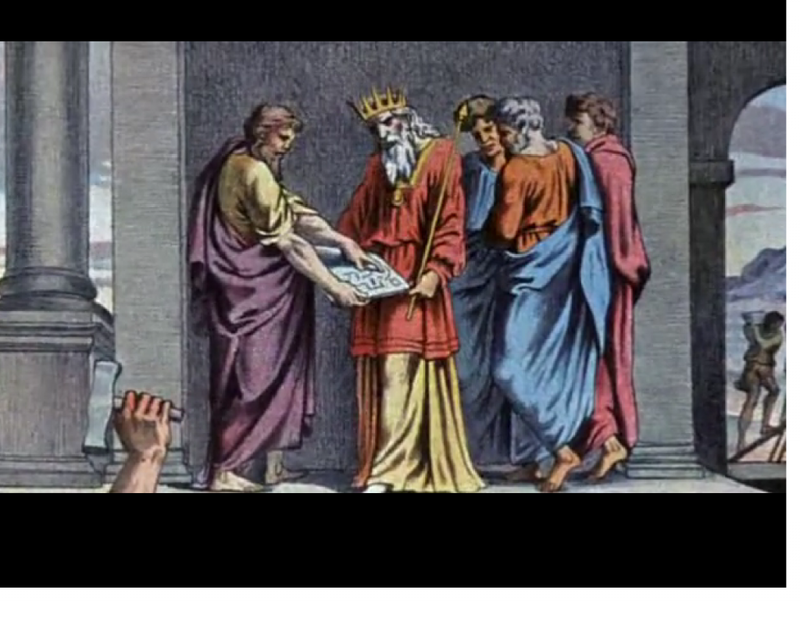 The first revelation occured in 610 A.D. It was the period when the population in this area still had many gods, the Christians were only a few and the practice of isolation for praying was almost unknown. Yet, Muhammad started before this year his so-called tahannut, spiritual retreats in the desert near Mecca. According to legends, before his birth, his mother heard a voice saying that her son's destiny was to be his people ruler and prophet and at the age of 4 two angels opened his chest and took out a drop of black blood from his heart, leaving him alive to fulvil his faith(Quran, sura 94). The first revelation occured while the prophet sat in cave and Angel Gabriel came and ordered him to read from the book he brought. Although he rejected it, finally he read. And the angel ordered him to spread the word for God created the man from a drop of blood. Muhammed obbeyed. And this is the meaning of Islam - to obbey. He shared his revelation only to his wife, Hadige and a few relatives. 3 years later, in 612 A.D. after another revelation he made his public his knowledge. And there is no violence in it. Muhammad spoke about the almighty of God and His kindness, about the end of the world and faith and about the happiness promised to the virtous ones. Allah is the only God and He is the only owner of the Black Stone in Kaaba, said the prophet. According to Mircea Eliade History of religions, this was not quite a declaration of war but an attempt to get his people out of ignorance. Nobody believed his message. On one hand, a religion with only one God made his tribe fear of losing privileges, on the other hand people asked for wonders. Yet Muhammad still believes he is God's messenger(rassul Allah) who brought the Revelation(Quran) to people. The wonder came. Tradition says that the prophet travelled from Mecca to Jerusalem(Read o brief travel guide for Jerusalem) on a winged horse and then visited Heaven. Despite this legend Muhammad had to leave Mecca in 622 A.D not to be killed. for Iatrib(the old city of Medina), which will become the political and religious center of Islam. Hegira or the immigration was a succes and it was here, in Medina, where the Islam organization began. All Muslims, those in Medina and those in Mecca became one community, umma, so the privileges of different tribes were abolished. In 624 AD, as the Jews refuse to recognize Muhammad as a prophet and more than that shew that he knew nothing about the Bible, he asked Muslims not to pray to Jerusalem anymore, but to Mecca. This is the moment the prophet becomes a politician. He proclaims that the Holy Stone in Kaaba at Mecca was put there by Abraham and one of his sons, Ismael and that the holy place of Islam is under heretic reign. The ideea was that Islam was to replace Christianity just as Christianity had replaced Judaism before, for theese two religions failed in sharing the right message. In 627 AD, Muhammad's army achieves a first victory against the caravans to Mecca. The tribes of Mecca put Medina under seige in the same year. They had to face a desert storm and failed after 2 weeks. The prophet, now general of his army noticed that some Jews were suspect and ordered their execution after the seige. In 629 AD, Muhammad and 2.000 warriors entered Mecca and celebrated for the first time the pilgrimage ritual. It was the real beginning of Islam since in 630 AD the prophet and 10.000 occupy Mecca and purify Kaaba. The religion of Islam was not only a new religion but the end of gods. See Moorish Monuments in Spain at Malaga! In March 632 Muhammad left Medina for Mecca in his last pilgrimage. According to tradition, he was told by an angel that Islam is the new religion and that his mission was done. The prophet returns to Medina and died on June 8, 632 AD in his favourite wife's house, Aisha. Was burried not in a cemetery but inside the house where a monument was built later the Mosque of the Prophet. Travel tips to Mecca coming soon. On January 18, 2015 Saudi Arabia announced that pilgrims will be allowed to visit not only Makkah and Medinah but also another 5 travel destinations. See detalis in Archae-News. Join us on Incredible Destinations Facebook Page or Twitter IncDestinations account. This brief Holy Mount Guide will lead you to what is called the heart of the Holy Land and to Jerusalem. So, since the Patriarchs and later the muslims, Holy Mount has made Jerusalem the most wanted place on Earth. Fot this reason it was conquered and destroyed 36 times in 3000 years. This is what our guide forgot to tell us. In 10 century BC, David and the israelites conquered the area and prepared to build here a temple. It was David's son, King Solomon who succeded in doing this job in 957 BC. The Temple on the Holy Mount, thus, became the place where the Ark of the Covenant, the device containing the tables of the law, was to dwell in. 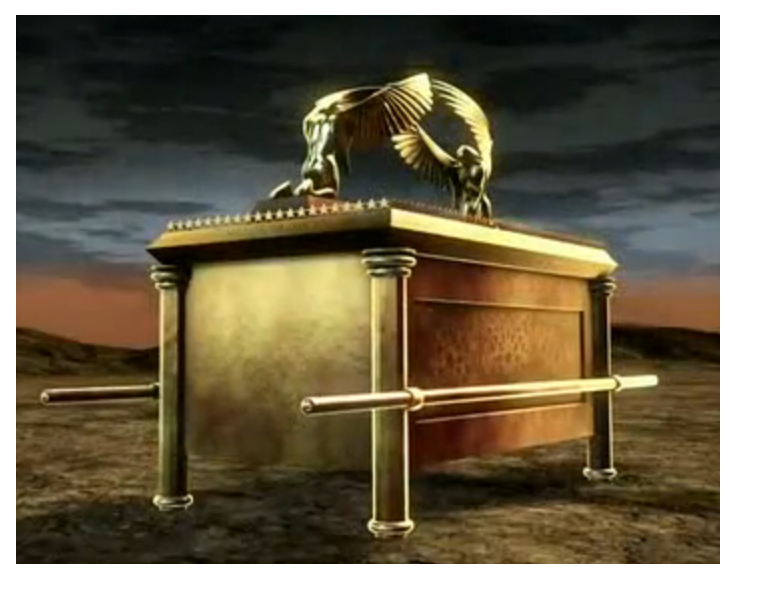 The Ark of the Covenant was hidden in the most secret chamber of the Temple, the Holiest of the Holy. For this is a Holy Mount Guide, we shall not talk about strange theories like who built the temples, the aliens and so on. In the 6th century BC (year 586), the babylonians conquered the Holy Mount and destroyed the temple, under Nabucodonosor. The Jews had to face a 70 years exile. But there is more to say about Solomon and the Holy Mount. In 2013, dr. Eliat Mezar discovered a 3000 years old jar containing data about the history of the Holy Mount and becoming a great Holy Mount guide into our ancient history. 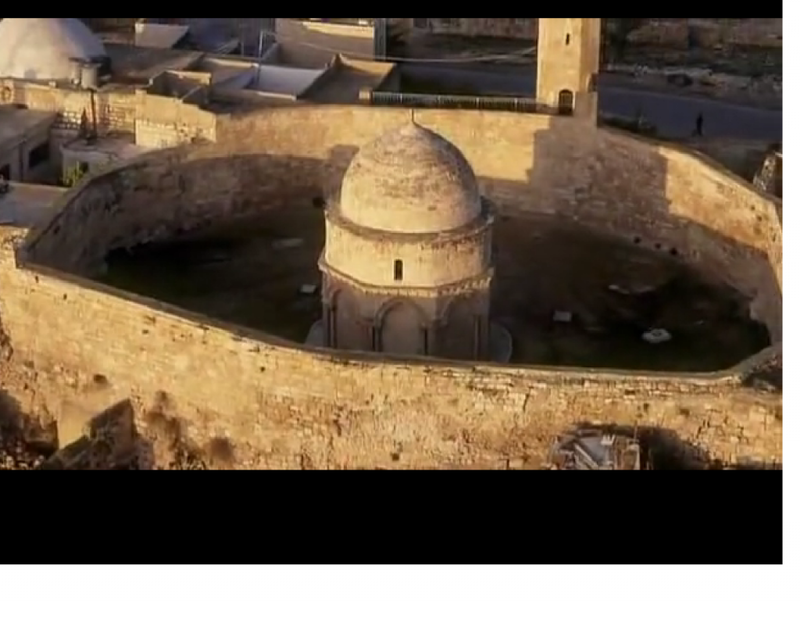 He found it near the southern wall of Jerusalem, which means the Temple was here at that time. And the great Solomon's Ring might be also found under the ground. But under ground archeologists found blocks of stone which were to be the foundation of the Temple that are not only hard to break(they are even 6 hundred tons weight), but nobody wants that. According to some intelligence sources, it would lead to another world war for it contained not only the secret of God but also a huge power. As a tourist you are not allowed to know more and you really need not, but since you are in the area, don't forget Solomon's quarries. They are beyond the muslim quartier in old Jerusalem. Those who built the first Temple are believed to have extracted the stones for the walls from here. See Moorish monuments in Spain! For Persians who built here the Dome of the Rock 6 centuries after the israelites had been sent to exile again by Romans, this rock was the place Mohammed ascended to Heaven and it is believed that under it was the secret chamber, the Holiest Holy where the Ark of the Covenant had been kept by the kings before. That is why this place is so important and that is why we decided to write this Holy Mount Guide, a short guide for visitors like us. 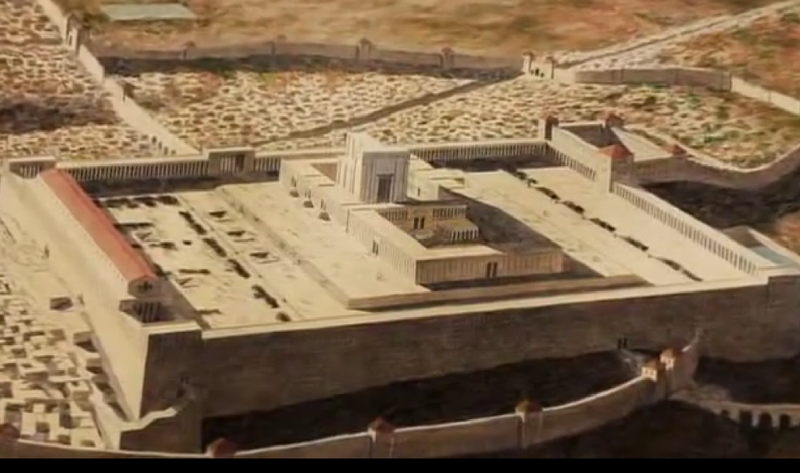 And there is another interesting thing you should before going to Temple Mount. When Solomon's Temple was built the Sun rose at 30 degrees south-east during winter solstice and 30 degrees north-east at summer soltice. When they started to build Washington, for the same coordinates, the Sun rose at 30 degrees south-east in winter solstice and 30 degrees north-east at summer solstice(C. Knight - Before the Pyramids). 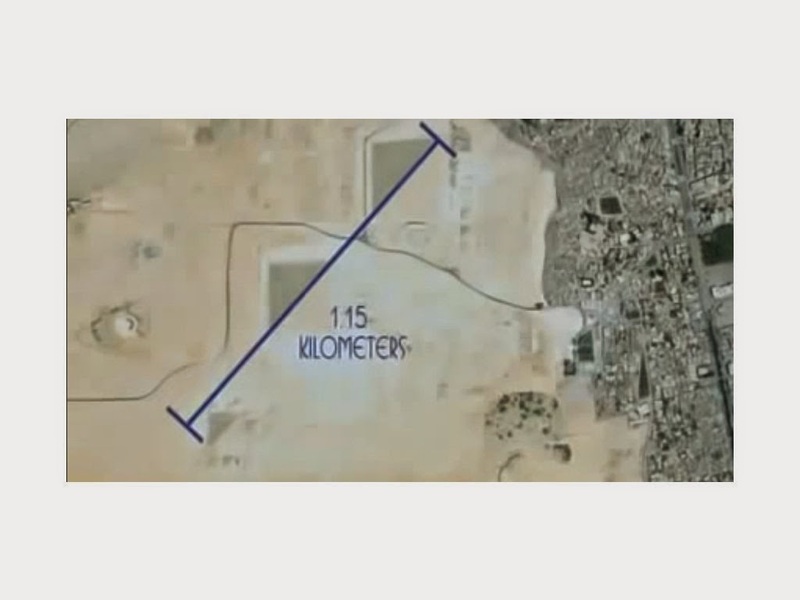 Why the REAL shape of The Great Pyramid in Egypt can be seen only twice a year? Read New discoveries about the Great Pyramid! 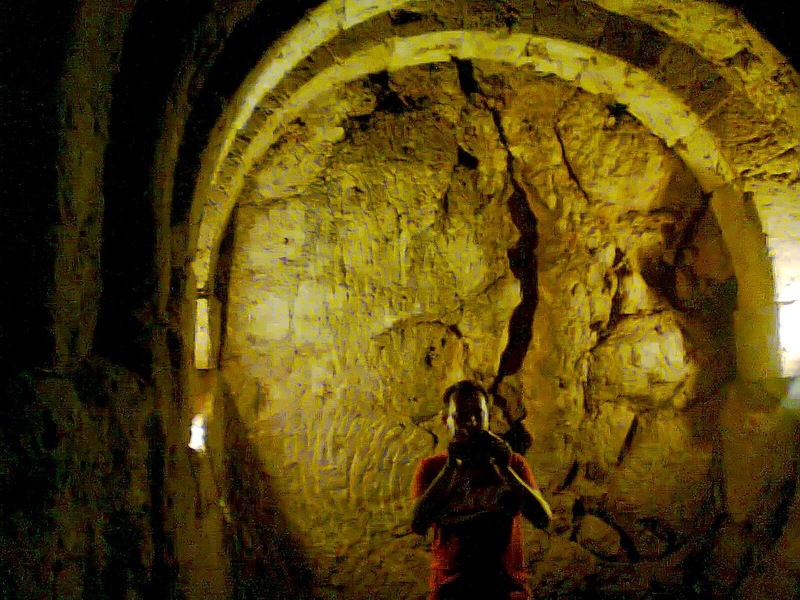 These new discoveries at the Great Pyramid in Egypt plateau will change history for sure. One cannot think of anything else for the discoveries made by archeologists and historians at the Great Pyramid in Giza are quite overwhelming. There are ten things, discoveries not well known about this Pyramid called the Great Pyramid in Egypt. 1. The Great Pyramid of Giza is not a classical pyramid. Its shape can be seen only from the sky and only twice a year - at dawn and sunset equinoxes, at spring and autumn. 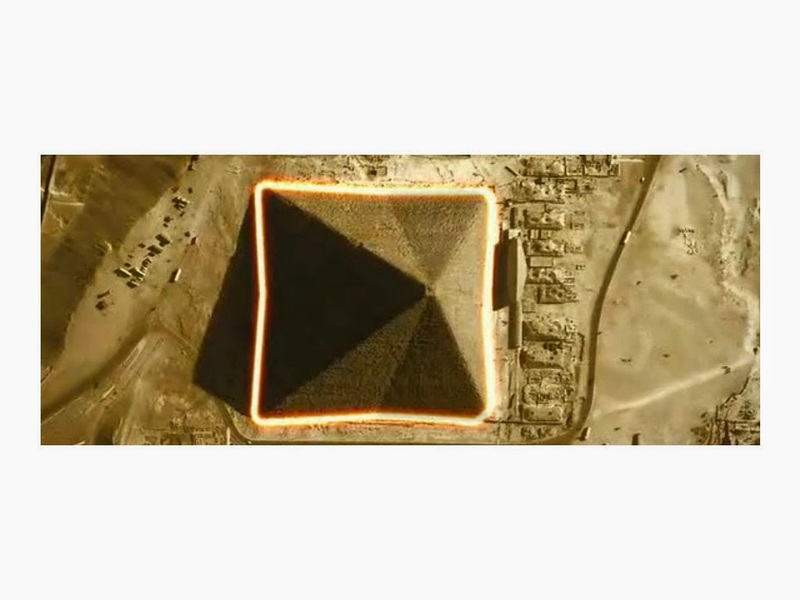 A British pilot saw this while flying around the Great Pyramid. 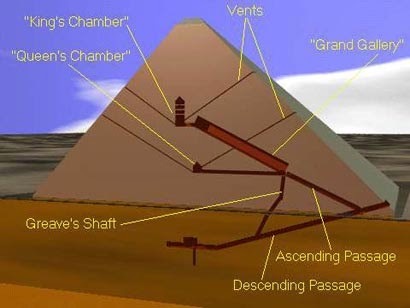 So we actually have 8 sides in the The Great Pyramid of Egypt but only seen from the sky and only twice a year. Terrorist threat by December 2014 in Egypt, see areas. 2. 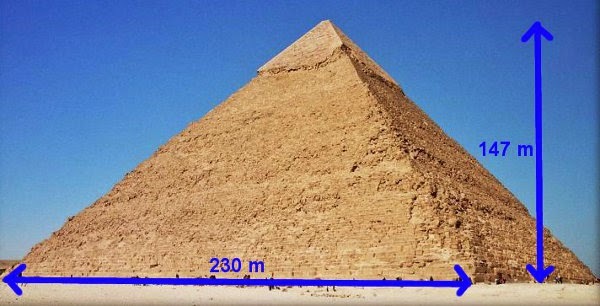 The basis perimeter of the Great Pyramid is 921,42 meters. It might be strange but if we get this perimeter X 43.200 we find the circumferinte of the Equator, which is about 40.075 km. 3. If you take again 43.200 X 146,72 which is the height of the Pyramid you find Earth radius at the poles which is 6.356,60 km. 4. Why is it so important, this number : 43.200 or 432 or 432.000? Well, in Mayan mythology 6 katuns or cycles of the Earth is 43.200 days. In Northern mythology we find 540 X 800 warriors which is 432.000 going to fight against the Wolf. One day in Brahma's life is 432.000 years for humans and Kali Yuga, which is a cycle on Earth is also 432.000 years as we, the humans, see it and the kings of Babylon ruled for 432.000 years. 5. Another thing very important you didn't know about the Great Pyramid in Giza is Orion. These are the numbers. The 3 pyramids of Giza. And now, this is the Orion's belt.This is what astronomers discovered. I have no comments about it. 6. We get the pi number = 3,14 if we divide the Pyramid perimeter to the double of its height. And we find the distance from Earth to Sun if we multiply its height by one billion. 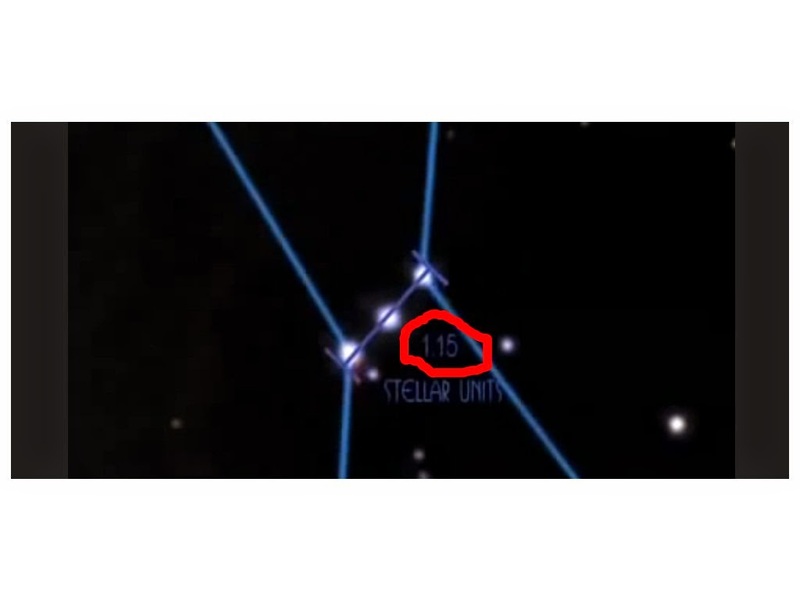 The distance between our planet and its star is about 148.000.000 km and the Great Pyramid height is about 148 m.
7. 2.600.000 blocks of stone were used for building the Great Pyramid. Many of them are 70 to 100 tones weight. Nowadays we do not have the technology to make similar constructions. And we have a 6 million tones Pyramid while the Earth is a 6 X 10.000000000000000 and so on, weight. 8. Why did they build it? 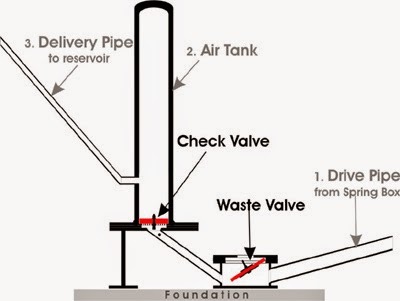 Well, have you aver seen a hydraulic pump with compression chamber? Take a look at these images. This is a pump. And this is the Great Pyramid in Egypt. 9. The Great Pyramid in Egypt perimeter is almost identical to the Pyramid of the Sun in Teotihuacan, Mexico, about 900 m.
10. Near the Great Pyramid they found boats in the sand. Why are they similar to the boats built nowadays in the Titikaka lake, in Peru. This is a boat in Egypt. And this is a boat in Peru and Bolivia. See more about Bolivia and the incredible ruins of Puma Punku! Or maybe you like ancient Greece! I have visited Styxx, the river of the dead this year. It was during our vacation in Greece and we have decided that we should visit this legendary river, called Styxx which was in Greek mythology the border between our world and the underworld of Hades. So, the best thing one can do in order to visit Syxx River is first of all to come to the awsome Greece. Photo : view from Parga. The River Styxx, or Acheron as it is also called, was the river of death and sorrow. You can read more about it here. What I wanted to tell about it is that nowadays it is a funny place, indeed mysterious and a little strange first of all because of the silence that sorrounds the area, but a nice place to visit, to have a beer in the forest or in the bloody cold water. How do you get there? The Death River in Greece is the river the souls of the dead had to cross to get to the underworld. The Death River is not so scary as you might think. The Death River is only cold like Hell. It is also the basis of Greek mythology and the answer to question where we go after death. Legends say that the Death River is the place where Achile's mother brought her child to make him invincible. She had to bathe him for the waters or the Death River were said to have special powers. None could be hurt after swimming here. Nowadays, in order to be invincible when crossing the river you need special slippers. This lady didn't listen to the guide. Stones are rather sharp and mercyless. And more than that you have to get undressed. The Death River is so deep in some places that you cannot pass dressed or with your camera. I have tried it this summer(2014). No way, man. At least not when you try to swim with one hand and make a movie with the other. The Death River does not forgive. The Death River is about 30 km from the city of Parga, one of the most interesting holiday destinations in Greece. The Death River comes directly from the mountain, this is the reason for it is so bloody cold. But if you are ok with that, it may be an incredible experience. This river cut his path through mountain but in the same time it is quite accessible. In ancient legendary times this was the river you had to pass to find peace into the underworld. Fortunatelly, now it is only rafting. You must pay about 30 euros to get the boat. Thousands of years ago, the boatman, called Acheron wanted only one coin. Your relatives put it in your mouth because you were dead. Lol. The Death River is near the Oracle of the Dead. See where Achiles, Oddyseus and all the Greek ancient kings found their future before the War of Troy. They came to the Necromanteion! Theese are the photos of Nekromanteion, the ancient oracle of Death in Greece. We have captured the photos in 2014. To enter the Nekromanteion of Greece you need to pay 2 euros and to take photos is free. The complex made of stones is quite interesting. For the stones of Nekromanteion are heavy and, still, they made walls with them. So, if you ever visit Parga in Greece, this is a place you must see. 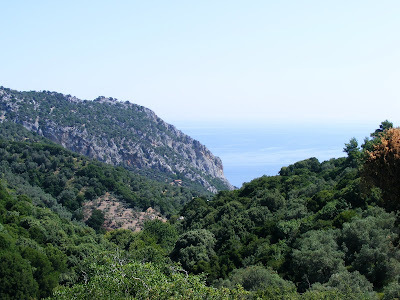 It is about 20 km from Parga. It is here in this photo of Nekromanteion where we caught Achiles. According to our guide, Achiles came to this oracle. It was in his journey to river Styxx. But here, in this oracle Achiles found out something about his future. No, this is not Achiles, it is but the gate to Nekromanteion and to the underworld. Here at the gate you met the souls of the dead in Nekromanteion and here they spoke. Read more about the Nekromanteion where you could talk to the dead. During the ritual, if the dead answered yes to your question from this huge jar came wine. If they said no, it was only water. This was the ritual at Nekromanteion. This site was discovered in 1955. Homer wrote about it in the 8th century B.C. Read more about the oracle of the dead or Necromanteion of Greece! The oracle of the dead and the whole ceremony while calling the dead in the Oracle of the dead in ancient Greece, near Parga, had a name : nekiya, which means the ritual when living people called the dead to ask them about the future. The Oracle of the dead in Greece, Parga was, thus, a temple. Oddysseus, the great greek hero came here to ask what he should do in order to return home where his wife, Penelope, was still waiting for him after the war of Troy and after wandering over the seas for more than nine long years. And not only him. The Oracle of the dead in Ephyra, Greece, also known as the Necromanteion had also a secret chamber. It was there where the one who wanted to talk to the dead, entered. Descending to the oracle of the dead was an adventure. It could last days or even weeks until the pilgrim was ready to face the souls. It is interesting that while the pilgrim passed through corridors and gates or the Oracle of the Dead he was asked questions by the holly guide and he found answers to his questions only at the end of this journey. The Necromanteion was not the only oracle of this kind in Greece or, later, in the Roman Empire. We find such temples also in a cave at Cape Matapan, in southern Greece, where the Spartans built another home of Hades or in Heraklea Pontica in nowadays Turkey, known as the modern city of Karadeniz Eregli, at the Black Sea. Necromanteion is the oldest oracle in Greece. Necromanteion was burnt and destroyed by the Romans while their expansion in 167 BC. 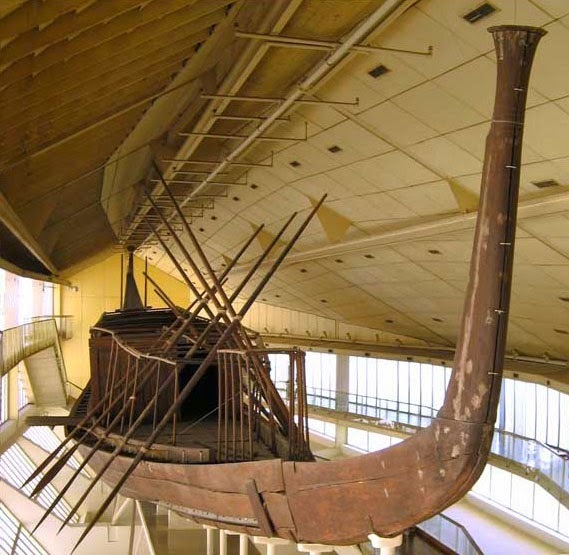 It was described by Homer in the 8th century BC, by Herodotus in the 5th century BC and was discovered and excavated in 1955 A.D. Nowadays the ARCHAEO TRAVEL NEWS are interesting. Join our channel on YOUTUBE! And this before you can visit this terrifying place where, according to ancient Greek mythology, three rivers of death, sorrow and pain met in order the ancient River Styxx to arise. This site was located on the banks of the Acheron River in Epirus. Now it is in the province of Prevenza, the new city built after Nikopoli was devastated in the 12th century. To get to the Necromanteion it is very easy if you visit the city of Parga in the south-western Greece. See more PHOTOS ABOUT NECROMANTEION! Found theese walls interesting? They are the same walls as Puma Punku's although South America had not been discovered in the 1th century BC. See Puma Punku in Bolivia! The Necromanteion was one of the places of ancient Greece were pilgrims came to talk to the dead or to their beloved ones who had passed away. Necromanteion is also known as the oracle where our world was connected to Hades, the underworld, where the souls of the dead where taken by the boat-man Acheron to the other world. And it was not a nice place to stay. This is the Necromanteion in Greece. According to Herodotus, the Necromanteion was the most important oracle among the others in ancient Greece.